I would like to present my hand painted oil on canvas painting (recreation) of the artwork DEPTH PURPLE. I made this piece with the same amount of soul and emotion just like the first original painting. This piece is created with oil paint on artistic canvas using my unique technique of a palette knife. The artwork has texture, you can feel the strokes by touching the painting. By purchasing on this site, you are buying directly from the artist Leonid Afremov. I guarantee your satisfaction and the best customer experience. Each city has something peculiar about it. These small and big peculiarities create the unique atmosphere of the city, making you come back again and again. Some regions boast high mountains, and every tourist plans one’s route to climb the most famous peak. Other cities attract everyone by their bustling social life and cultural heritage. That’s where you can visit museums that are famous all over the world or listen to the ancient legends of old-timers. Some cities are situated on the sea shore or river bank, and it is a well-known fact that we can watch the flow of water for hours. Various oceans, seas, rivers, streams, lakes and waterfalls take our breath away inspiring us to romance and adventures. People all over the world agree that Venice is one of the most remarkable places, and it is mostly because of its winding canals and numerous bridges. And if any town includes all these three features, you can be sure that you will never forget the time you spent there. The night is the queen in this picture, and there are no limits to its quiet charm. The sky is purple and dark blue, so deep that there are no stars visible. Some people may argue it isn’t so romantic, but clouds have never been an obstacle to lovers especially when you can stroll along a beautiful river like that! The building in the central part is of great importance to every citizen, because it seems to be standing right on the bridge. It looks like a big ship that is about to leave the ground and set off for a world cruise. The sky above is filled with yellow and red, as if passengers of this mysterious liner were enjoying some mystical fireworks. The river is just as calm as the night city. There are no people in the streets, no vessels swimming by. The water is purple as well, reflecting the richly colored sky, but the illuminated central house is also mirrored in its still surface. 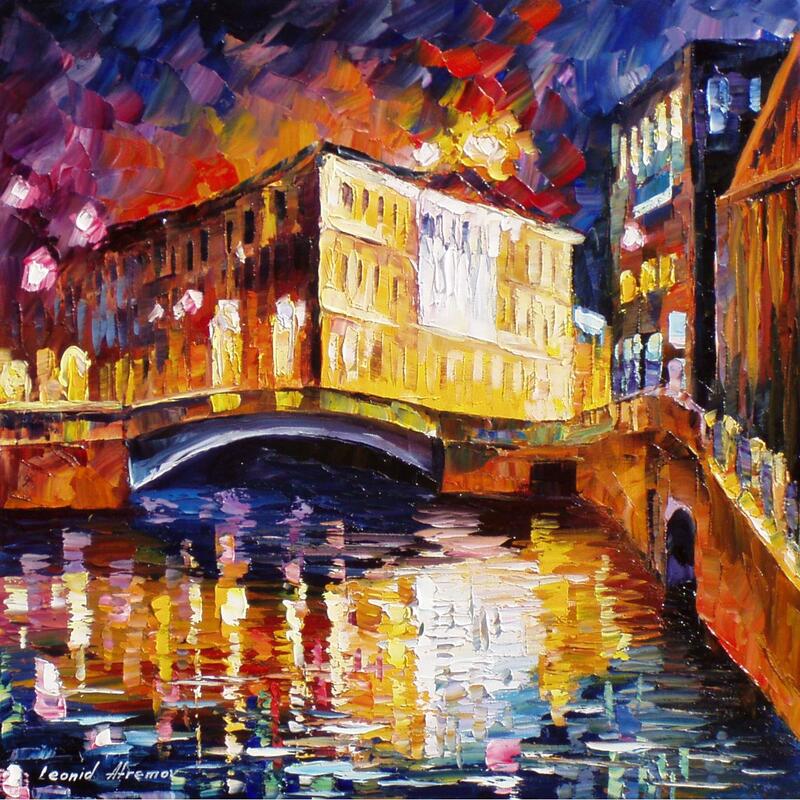 This elegant oil painting by Leonid Afremov will remind you that beauty is everywhere around you. Hang it on your wall and let this beautiful evening last for many years!